Here in Ontario it’s Thanksgiving weekend which always gets me to thinking of the blessings in my life. As I take the time to truly reflect on my journey, I’m struck by the amazing opportunities, people and gifts I’ve been given. There were times in my life when I had much less, when my health failed, when finances were in the gutter…so many times when people would step in with a gesture of kindness which would change my negative perspective. I can remember right after my first daughter was born I found a homemade meal on my doorstep with a loving note from someone wishing us well. It probably the BEST meal we’ve ever eaten and reminded us that we had folks pulling for us. With this in mind I’m so happy to have teamed up with This Lil Piglet to invite you all get in the kitchen and create something delicious…oh and be sure to check out This Lil Piglet’s Turtle Pumpkin Cheesecake, you’ll thank me later. Begin by heating the oven to 325°F. Mix the graham crumbs, 2 Tbsp. 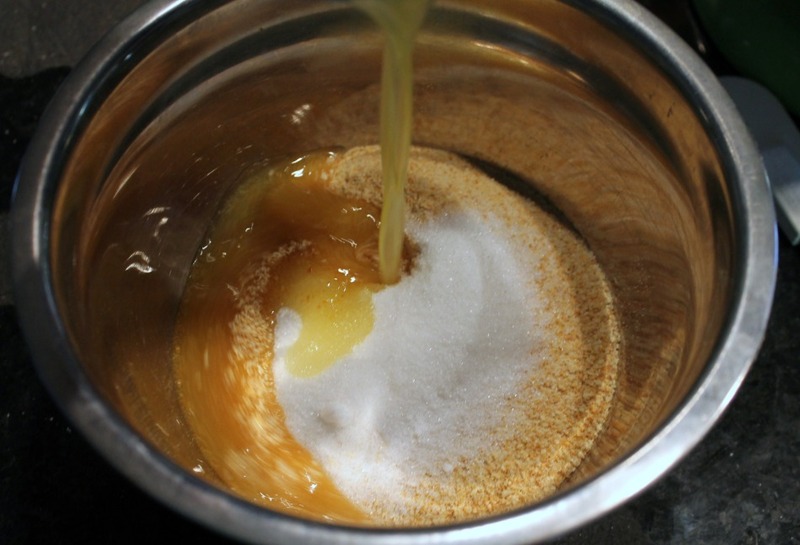 sugar and butter until they are well blended. Now press the graham cracker mixture onto bottoms of 18 paper-lined muffin pan cups; I found it easy using an ice cream scoop. 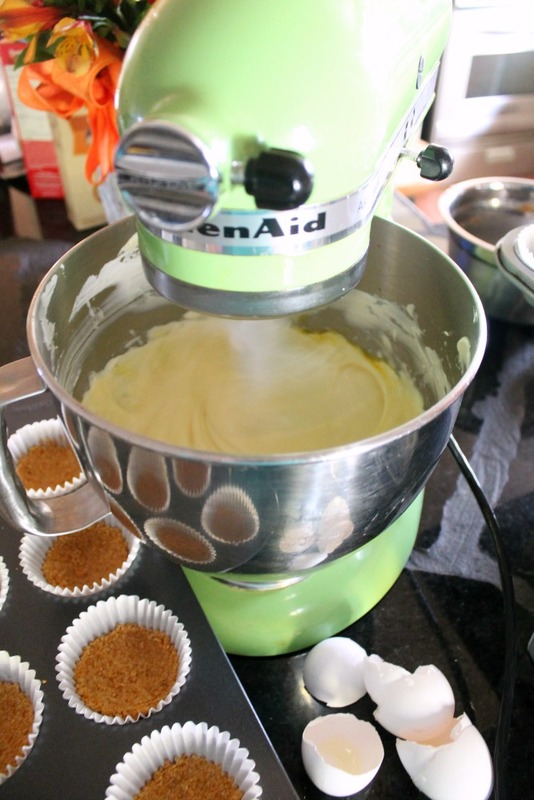 Set aside the muffin tins and beat cream cheese, remaining sugar and vanilla with mixer until blended. Add eggs, 1 at a time, mixing on low speed after each just until blended. Now pour the cream cheese mixture over crusts in the muffin tins. Bake 25 to 30 minutes or until centers are almost set, then cool completely. Spread evenly with 1/3 cup strawberry jam, (I was far too generous and ended up with very messy cheesecake cups), garnish with fresh strawberry halves and drizzle with chocolate sauce. 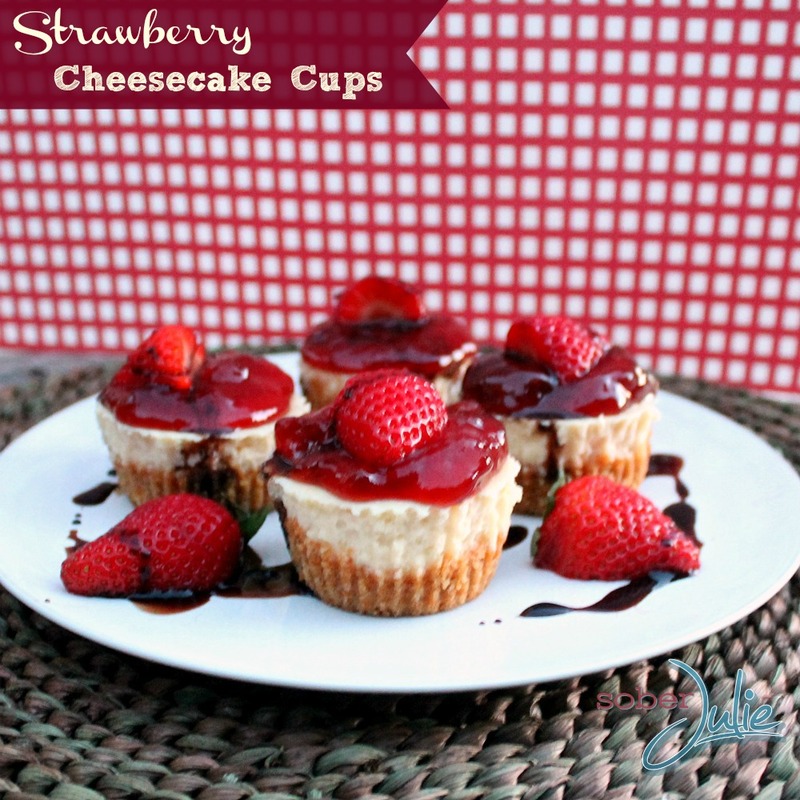 Lovely Strawberry Cheesecake cups which are perfect to take to gatherings. 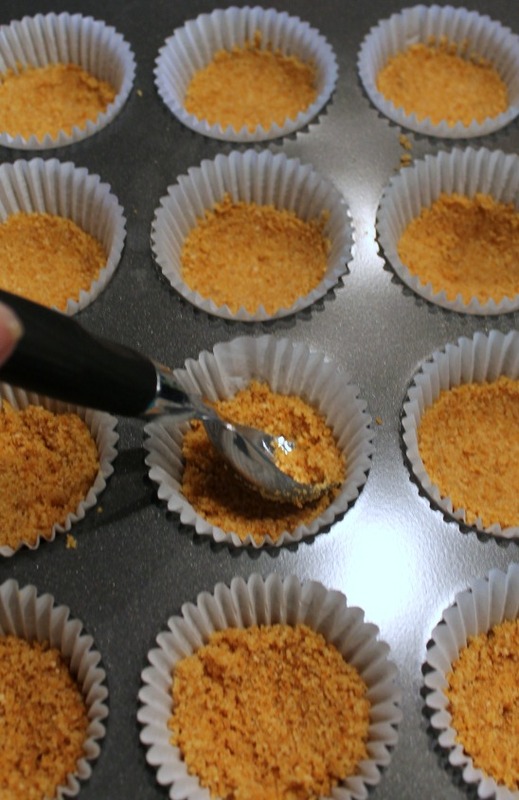 MIX graham crumbs, 2 Tbsp. 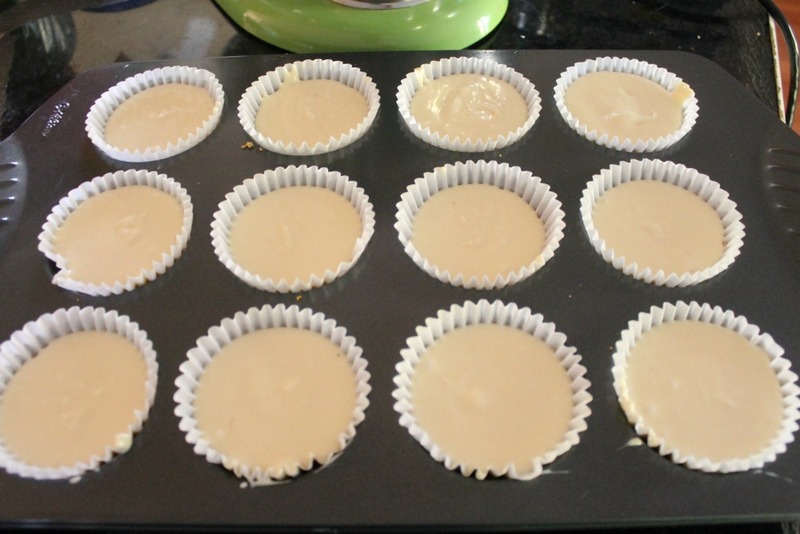 sugar and butter until blended; press onto bottoms of 18 paper-lined muffin pan cups. BEAT cream cheese, remaining sugar and vanilla with mixer until blended. Add eggs, 1 at a time, mixing on low speed after each just until blended. Pour over crusts. BAKE 25 to 30 min. or until centers are almost set. Cool completely. Refrigerate 2 hours. Spread evenly with ⅓ cup strawberry jam. 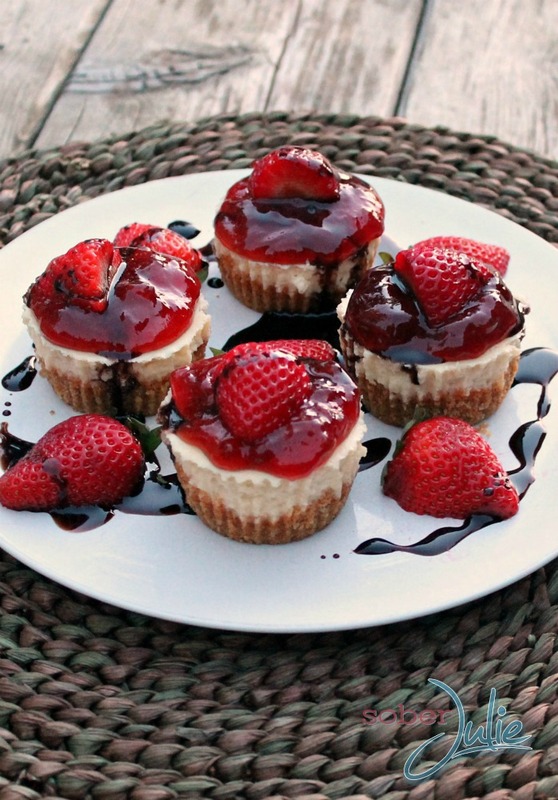 Garnish with fresh strawberry halves and drizzle with chocolate sauce. Hard boiled eggs are a big part of my Polish Thanksgiving dinner! They are served with kielbasa before the big meal. We give thanks by using eggs,by having a bog ole breakfest,,eggs,bologna,hashbrowns,and toast! Yum! I use eggs for western sandwiches on thanksgiving for breakfast! We almost always have deviled eggs with Thanksgiving dinner. We did have them for last night, but then forgot to put them on the table. Guess what we are having today! Sorry if this posted already. I didn’t see it show up. I give thanks by making a huge breakfast for my family, including omlettes and egg salad. I use eggs to make a big breakfast of scrambled eggs, pancakes, bacon and sausages on thanksgiving morning! I give thanks on thanksgiving by starting the festivities with my family’s favorite deviled egg recipe! I use eggs to make a breakfast casserole and pumpkin pies for Thanksgiving Day. My family makes deviled eggs every year for Thanksgiving. It just doesn’t seem complete without them. We give thanks around Thanksgiving by having a big scrambled eggs and toast breakfast Thanksgiving day morning! I use eggs to make great casseroles such as broccoli or celery casserole and desserts such as the cheesecake cups.